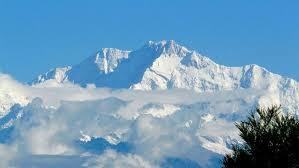 This is my seasonal Travel blog, about a Tibetan nomad and his encounter with the Yeti. It’s fiction, just published in Tales from the Forest Journal and the Bray Arts Journal. Next blog is about the time I spent with nomads in Chang Thang, the pasturelands that run from Ladakh, North India into Tibet. Amnye came from those pasturelands. He spent much of his life with his family in the refugee camp in Choglamsar, Leh, Ladakh trying to adjust to ‘settled’ life without his herds . This is one of the stories he told me, made into fiction. He was a very special man, and his granddaughter and great-grandchildren now live in Dublin. 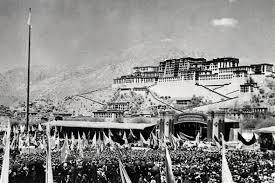 The Yeti came in the moonlight, after the monks had blown their horns for evening prayers and Amnye had taken the Yak to the pastures below the temple. Momo, his wife, gave him his dinner when he came back. “If the Abbot asks for more tax, I’ll throw my dinner at him.” she said, as the children slurped soup around the stove. The dogs were silent. “Don’t desecrate the clergy.” said Amnye, but inside he agreed with her. That night, the stars gleamed like the jewels of the Gods but a terrible thing happened. A howling whistle like a ghost’s lament came up from the pastures. Amnye sat up with his gun and stood at the door and he saw every yak in the pasture dead. Still, black shadows under the moon. “The Yeti!” he cried, as Momo came to his side, and the dogs growled like thunder. Amnye saw the black figure facing him, wheeling his arm with a yak pat on his head. Amnye knew who he was, pretending to be a man, calling him into the pasture so he could choke him to death. “Demon! Murderer!” said Momo, spitting on the ground. 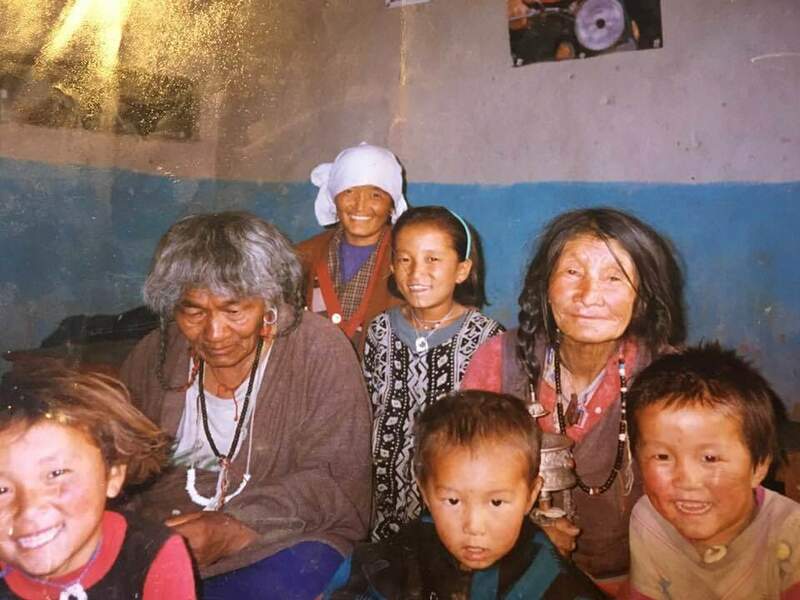 The children woke up and huddled around them, staring at the dead yak and at the huge mi drong tearing up the hill, his whistles howling in the the wind. Amnye packed a bag of tsampa flour, slung it on his back with his rifle. The little ones tugged at their Pala’s thick chuba coat, but Amnye would stop at nothing, after this third attack the yeti had made on the village. In the morning, the monks prayed for Amnye and the Abbot did not ask for tax. They said they understood if he had to kill. They had seen such things since the Han soldiers had marched into their land. Amnye’s boots crunched over the crumbling rocks on the pass, and the white peak of the Goddess mountain gleamed like a knife under the moon . Amnye knew the crack in the mountain where the yeti lived, and where he had taken his cousin’s daughters three years before. Amnye stopped at the creak for his tsampa, and lit a small fire in the crevice, A yeti knew fire. He would smell the smoke but Amnye was ready. He clutched his rifle, the one he’d had since the sky fell down and the wolves howled on the Goddess Mountain. Since the Han came. The sky had never risen again, and all Amnye had known was misfortune. Now, twenty yak were dead and his family would starve in the winter. With all his thoughts of war and enemies, a shadow fell over him. Amnye bowed to the lama, who stood before him. But inside, he was angry. 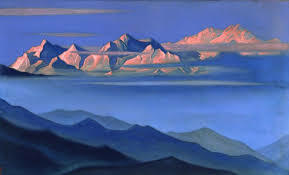 The lama had grey hair in a knot and a grey beard draped to his waist and his chest was shiny and strong. 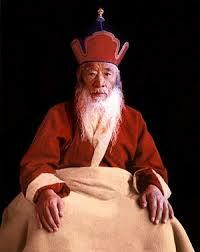 Chatral Rinpoche, eminent Dzogchen Yogi. “Take your prayer wheel.” said the lama, and vanished into the shadows. Amnye did not have his prayer wheel. He had his rifle. In the morning, he saw the eagle in the sky and it swooped down and scratched his bushy hair. The eagle turned and stared in to his eyes, hovering right in front of him on the path. “You should listen to the lama! Retreat! Bring only your prayer beads, old man…” he swooped away, high in the sky, and danced around the Goddess’s peak. Amnye reached the peak, and icy winds bit his cheeks, and his tsampa was empty. He saw the Yeti, mocking him, with a yak pat on his head, wheeling his arm around and whistling terribly. Amnye pulled his rifle up, and aimed at the heart, as the Yeti thundered towards him, his sharp white teeth gleaming in the sun, his hairy body dull and thick, his shoulders no man had the back to carry. He slung Amnye over the hairy shoulder, like a piece of meat. Like every other victim, he was carried into the cave of the Goddess mountain. Amnye woke in the dark. His cousin’s two sisters were making yak soup on the fire. Their minds have been made simple by that monster, Amnye thought. One of them, the salt trader’s girl, was pregnant. It was unimaginable. Amnye searched for his rifle. It was gone. Instead, in his sack, he found his prayer wheel and his prayer beads. He had not packed them, but there they were. He swung his prayer wheel, around and prayed for peace. 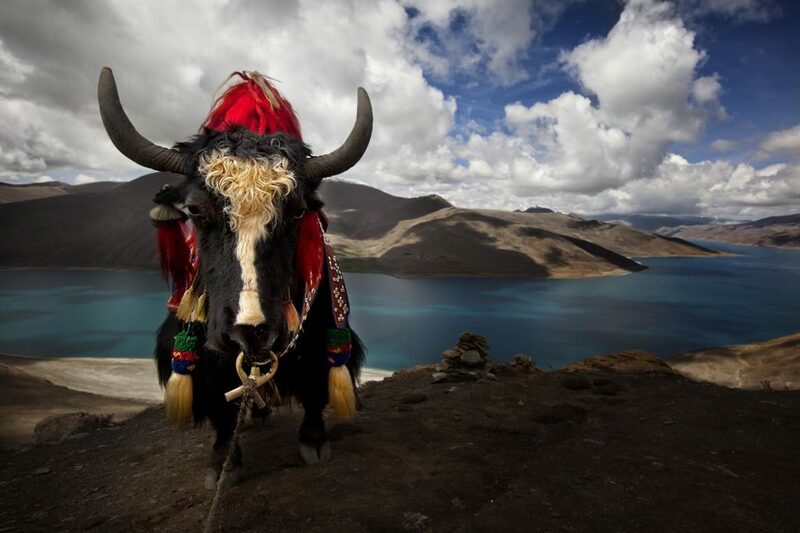 He prayed for his life, and for the lives of his cousins’ sisters, and the lives of the people in his family, and for the people in the village, and the yak to be reborn in De Wa Chen, the Western Paradise. He prayed for the end of the wrath of the Yeti. But a gleaming white figure sailed in through the crack of the cave, tall and shimmering, with silken black hair and eyes as deep as the Turquoise lakes. Her body was slender and wispy…the Goddess of the Mountain.